Personnel - A Short Film By Krzystof Kieslowski is an event that took place on 13-Dec-2006 in Hyderabad. If you haven't heard of Krzystof Kieslowski, it's unpardonable. If you can't pronounce it, however, it is not. A festival of his films starts today. If you can't make it, it had better be excusable. The Hyderabad Film Club, in collaboration with the Embassy of The Republic Of Poland, New Delhi, & the Federation Of Film Societies Of India, is screening a series of short films and feature films of Polish director Krzystof Kieslowski, as a tribute to the legend, from 13th to 20th December, at Sarathi Studios, Ameerpet. 16 short films and 5 feature films will be screened during these days. Today, the inaugural day, a short film called Personnel will be screened. Romek, an idealistic 19-year-old boy, takes a job as a tailor in the costume department of a Warsaw theater company where his new colleague, Sowa, is pressured to make a costume for an overbearing soloist named Siedlecki, who does not like the final result and takes his problems with Sowa to Romek, who defends him. Krzysztof Kieslowski was born in 1941 in Warsaw, Poland. At a young age he decided to become a theatre director, but during those days there was no specific training program for directors. So he chose to study film as an intermediate step. After that he continued his education in the famed Polish film school in Lodz, that also produced Roman Polanski and Andrzej Wajda. 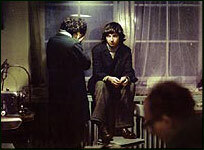 Kieslowski started his career with documentaries, focusing on the everyday lives of city dwellers, workers and soldiers. Though he was not an overtly political filmmaker, his productions were controversial, causing many discussions among the public as well as the authorities. He started with feature films, his first production was Personnel in 1975, which brought him the first prize at the Mannheim Film Festival. His other movies also received wide acclaim and honors. In the '80s, he started his ambitious project – The Decalogue, a series of ten short films set in a Warsaw tower block, each nominally based on one of the Ten Commandments. It is now one of the most critically acclaimed film cycles of all time. His films garnered a host of prestigious international awards, including the Golden Lion for Best Film and Silver Lion (Three Colours) for Best Director at the Venice Film Festival, and the Silver Bear for Best Director at the Berlin Film Festival, in addition to three Academy Award nominations. Krzysztof Kieslowski died aged 54 on March 13, 1996, during an open-heart surgery following a heart attack. The screenings are open only for invitees and members of Hyderabad Film Club. For details regarding membership and screenings, please contact Bh S S Prakash Reddy of the Hyderabad Film Club at 2373-0841/93910-20243. Be the first to comment on Personnel - A Short Film By Krzystof Kieslowski! Just use the simple form below. fullhyd.com has 700,000+ monthly visits. Tell Hyderabad what you feel about Personnel - A Short Film By Krzystof Kieslowski!